The New Brunswick cabinet has approved exports of more than 3,000 truckloads of pulp logs so far this year. A review of orders-in-council authorized by the cabinet this year shows that between January and August, 120,000 cubic metres of pulpwood from Crown land was shipped out of the province by Fornabu Lumber, AV Nackawic and J.D. Irving Ltd. The New Brunswick cabinet has approved the export of 120,000 cubic metres of pulp wood from Crown land so far this year. (Jacques Boissinot/Canadian Press)The pulpwood was destined for Nova Scotia, Quebec, Maine and Europe. Fritz Weirathmueller, an industry consultant, said there is currently no other option for the wood. "There's lots of pulpwood that's left in the forest today," he said. "We do not have a market for it." Weirathmueller said it's better to ship the pulpwood out of the province than to let it rot on the ground. But he says the ideal solution would be to find a use for it in the province. "It's a fibre that belongs in New Brunswick, that should be processed in New Brunswick," he said. Weirathmueller has been pushing a plan to turn the former UPM site in Miramichi into a facility that will use the entire tree through a sawmill, a plant to build engineered beams from wood fibre, and a wood pellet manufacturer. But the $200 million project lacks a firm commitment from the provincial government for access to Crown wood. Progressive Conservative Leader David Alward said on Thursday the Miramichi plan — so far — lacks a strong business case. In August, the provincial government gave conditional approval of a Crown pulpwood allocation to another project in the Miramichi area. If a feasibility study is positive, it would see a wood pellet plant established somewhere in the area. The Southeastern New Brunswick Wood Products Marketing Board said its members lost business earlier this year when J.D. Irving Ltd. received permission to export more than 500 truckloads of pulp wood to Nova Scotia. Ken Hardie, the manager of the New Brunswick Federation of Woodlot Owners, said his members can benefit when Crown wood is shipped to Europe, but not when it's transferring just across the border. "If the product is going off-shore, and not going to an adjacent market it actually keeps the market open, it benefits the marketplace as opposed to displacing us from the market," he said. David Palmer, the retired general manager of the York Sunbury Charlotte Forest Products Marketing Board, said the export of wood from the province is "exactly what we had feared when the forestry deal was signed back in the spring." The Alward government's new forestry plan gives Crown licence holders like J.D. Irving Ltd., Fornabu and AV Nackawic, access to 20 per cent more softwood from Crown land, an annual increase of 660,000 cubic metres. "Clearly there is already a surplus of pulp wood in the market," said Palmer. "The signing of the forestry plan ensures that there will continue to be a surplus of pulp wood on the market for the next few years." 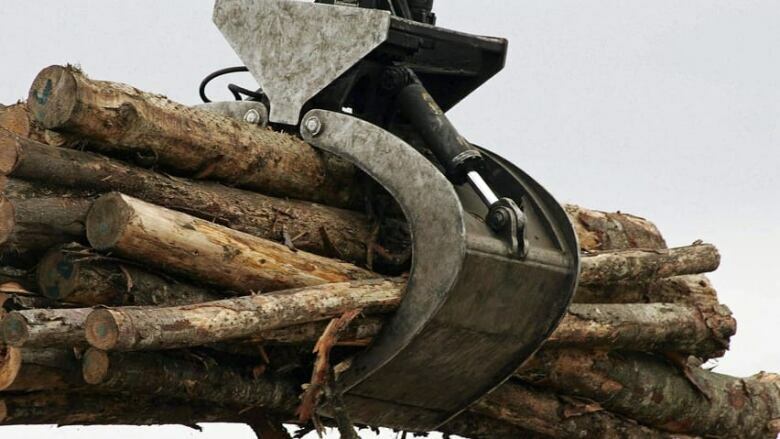 Palmer said while the increased allocation to forest companies is available immediately, it will take time for the companies to expand their mill capacities to absorb the additional allocation. That additional wood on an already glutted pulp wood market will drive prices down, he said. "The more pulp wood you put on the market, the lower the price for pulp wood is going to be," he said. Crown wood is less expensive to the forest companies than purchasing wood from private woodlot owners. Palmer said when Irving exported 500 truckloads of pulp wood to Nova Scotia, not only did it displace the New Brunswick private woodlot owners who were selling their wood in the Nova Scotia market, it undercut their prices. "Once again, here we woodlot owners are trying to compete with Crown wood," said Palmer. "The government is our biggest competitor." The Alward government announced in June that the last fiscal year saw the highest amount of sales from private woodlot owners in the last seven years.